The Bates ExPI™ (Bates Executive Presence Index™) is the first and only research-based, scientifically validated assessment to measure executive presence. The multi-rater tool is used to help leaders develop the presence and influence necessary for leading teams, driving strategy, and making an impact. Organizations use the Bates ExPI™ to develop future leaders, build the influence of seasoned leaders, and ensure teams are driving organizational performance. "The Science of Executive Presence and Influence"
Executive presence has long been acknowledged as a critical factor in leadership. However, its definition has often been mysterious and subject to diverse perspectives. As a result, leaders have received feedback on presence without a roadmap for action that connects clearly to business objectives. The default assumption is to equate presence with appearance and presentation skills. While these factors are important, they make up only a small piece of the "executive presence puzzle" that helps leaders sustain goal-directed action in an organization. The Bates Executive Presence Index™ takes executive presence to a deeper level. 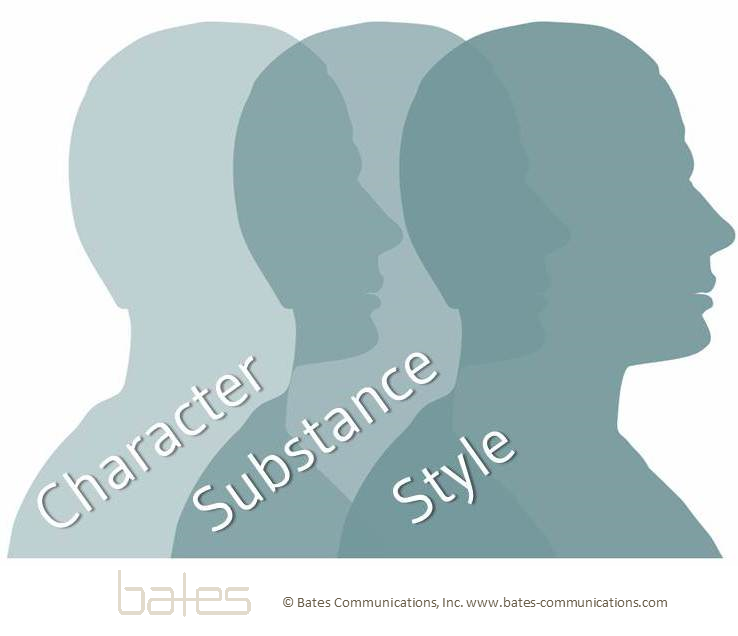 Through extensive research in leadership, communications, psychology, and social action theories and literature, we've clarified executive presence as a three-dimensional model of character, substance, and style. Within these dimensions are 15 distinct facets that are proven to make up a leader's overall presence and level of influence. How does the Bates ExPI™ Assessment work? The Bates ExPI™ multi-rater assessment tool measures perceptions of the leader’s strengths and development areas within these 15 unique facets. Perceptions of critical stakeholder groups are compared with the leader’s self-perceptions in order to identify strengths and gaps. The assessment is administered via an online questionnaire. The questionnaire is completed by the individual leader (self-rating), their manager, peers, direct reports, and other groups of critical stakeholders. The assessment contains 90 items and 3 open-ended questions. Participants receive a comprehensive feedback report with data on ratings broken down by rater category and at the item-level. All participants receive professional support to review, interpret, and apply feedback reports. Individualized and group-based approaches to feedback are available based upon the indicated needs of sponsoring companies and individual participants.